Maoist rebels in the central Indian state of Chhattisgarh have demanded the release of some cadres and withdrawal of security forces in exchange for freeing a senior official. The rebels abducted Alex Paul Menon after killing his two guards in Sukma district on Saturday afternoon. Mr Menon was holding a meeting with local tribal people when the incident happened. Maoist rebels have a strong presence in Chhattisgarh and neighbouring Orissa. The rebels have said their demands of releasing some of the their top cadres from prison and withdrawing security forces from the restive Bastar region of Chhattisgarh will have to be met by Wednesday in exchange for Mr Menon. Mr Menon, an officer of the Indian Administrative Service, is the senior-most official - district magistrate - of Sukma district, which is located in the Bastar region. District official, SP Vaidya, who was present at the spot, told the BBC by telephone that even as Mr Menon was interacting with the villagers, the insurgents first targeted his bodyguard. "Then they asked who the district magistrate was. Mr Menon came forward and told them that he was the person they were looking for. Later, they forced him to accompany them into the deep woods," Mr Vaidya said. 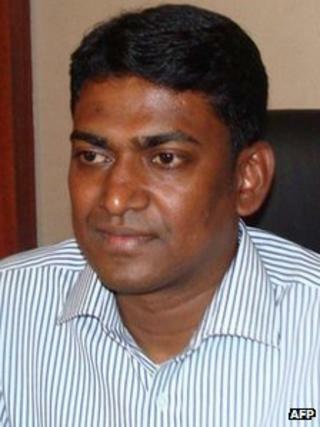 Mr Menon's wife Asha Menon has appealed to the rebels to release her husband on "humanitarian grounds". She told the BBC that Mr Menon was suffering from asthma and needed medical care. A group of eminent citizens, led by historian Ramachandra Guha, has condemned the kidnapping. "By killing the innocent security guards who were on duty and kidnapping Mr Menon, the Maoists have betrayed their lack of respect for human rights and democratic processes," a statement issued by the group said. Mr Bosusco, 54, was abducted on 14 March, along with fellow Italian Claudio Colangelo, 61, while trekking in a tribal area of Orissa state. Mr Colangelo was released on 25 March. Prime Minister Manmohan Singh has described the Maoists as India's biggest internal security threat. The rebels say they are fighting for a communist state and for the rights of tribal people and the rural poor.